I have tried to write this metaphysics page with simplicity and clarity in mind at all times. It explains (for the first time) a simple, sensible, logical solution to the problems of metaphysics - by describing reality in terms of one thing that we all commonly experience as one thing - space. 1. A summary of the central points. 2. What is Metaphysics? Deducing the Solution. 3. The Error: Newton's Particles, Mathematical Metaphysics and Physics. 4. The Solution to the Skepticism of Postmodern Metaphysics and Philosophy. 5. Important Metaphysics Quotes from Aristotle, Leibniz, Hume, Kant and Einstein. 1. What is Metaphysics? It is the study of the one substance that necessarily exists and causes / connects the many material things we observe. It is useful to quote Aristotle since he first formalised the subject of metaphysics. The first philosophy (Metaphysics) is universal and is exclusively concerned with primary substance. ... And here we will have the science to study that which is just as that which is, both in its essence and in the properties which, just as a thing that is, it has. 2. The one substance is this space we all experience existing in. As only one substance, space, exists it cannot be bounded by, created from, or contain another substance - thus it is necessarily infinite, eternal and continuous. 4. The many material things that we see as discrete and separate 'particles' moving around in this space are really formed from wave motions of this space (space is vibrating). 5. 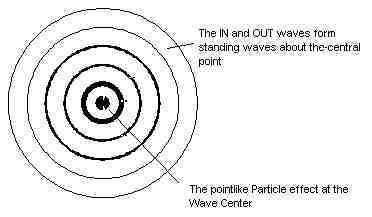 By describing matter with a spherical in out wave structure we can understand how the particle effect forms at the wave center and also how this 'particle' is in continual two way communication with other matter waves in the space around it. 6. This simplifies metaphysics from the motion of matter particles in space and time to the wave motion of space that causes matter and time. i.e. From a metaphysics of space and time to a metaphysics of space and (wave) motion. 7. This unites Science (empirical: we all experience existing in space; Occam's razor: simplicity of only space existing) with Metaphysics (space is the unity of substance which explains causal connection). 8. By correcting the errors of both these subjects we can then solve the central problems of knowledge in physics and philosophy as a foundation for solving the central problems confronting humanity and our future survival on earth. 9. This is not just an academic discussion on metaphysics, it is physical reality - how you exist as matter in space and interact with the rest of the matter of our observable universe. 10. This is the source of truth and wisdom - both necessary for our future survival. Metaphysics now has a reputation for being fanciful and ultimately empty of meaning. This is not due to the subject of metaphysics itself (as conceived by Aristotle), but rather due to the failure of philosophers / metaphysicists to solve the fundamental problem of metaphysics, i.e. "What is the one substance that exists and causes and connects our world of many different things?" The following quotes from Aristotle, Leibniz and Bradley explain this well. A simple way to explain metaphysics is to simply drop a ball. Notice that you do not see any obvious connection between the ball and the earth - yet they are obviously connected because we see the effect of this connection, the ball moves (accelerates) towards the earth. The same argument applies to the Earth orbiting the sun, an electron in an atom, how we can see stars across the universe. We give these connections names, e.g. light and gravity, but no one knew what these hidden causal connections were. This is known to philosophers as Hume's Problem of Causation and Necessary Connection, but really it is common knowledge that dates back to the ancients - the Problem of the One and the Many. Since we do not see the causal connection between things in space, this means that metaphysics must somehow be founded on something that we imagine. The problem here is that our minds are very good at imagining things that do not exist, e.g. dragons and particles. So you see the problem of metaphysics is simple and profound - we must imagine this hidden connection between things. To solve this requires true knowledge of physical reality, such that we can understand this hidden causal connection that our senses tell us must exist, yet we do not see. In the remainder of this short essay I will show you how to solve this problem. The easiest way is to just go back over the history and evolution of metaphysics, explain where we went astray, and then show you the correct path. "Greek philosophy seems to begin with a preposterous fancy, with the proposition that water is the origin and mother-womb of all things. Is it really necessary to stop there and become serious? thirdly and lastly, because it contained, although only in the chrysalis state, the idea :everything is one. This is an important quote, confirming this importance of one underlying substance to explain how matter is inter-connected across the universe. Surprisingly, after such a long period of failure to solve this problem we find that we can actually deduce the solution. We just had to ask; What is the Most Simple Science Theory of Reality? Clearly the most simple solution must be founded on only one substance existing, thus we are uniting science with metaphysics. This is important to emphasise, as it is not the simplicity that is important (it is nice), but the underlying unity of substance to explain causal connection. Given that we all experience many minds and many material objects, but always in one common space, thus to abide by science (empiricism / simplicity) we have no choice but to describe reality in terms of space. From here it is easy to show that there is only one solution, a wave structure of matter in Space. i.e. Space is a substance with the properties of a continuously connected wave medium and matter is formed from spherical wave motions of this space (thus explaining Aristotle's property of activity / motion as being caused by the wave motion of Space). Note: the diagram's circles are a two dimensional representation of three dimensional spheres / four dimensional spherical waves. And I do realise that this may seem radical to people brought up with particle concepts of matter (as I was), yet physics itself tells us that matter is a large structure of space, as required by Einstein's general relativity and quantum physics. Further we see that this solution satisfies the rules of both metaphysics and science - while also correcting their errors (giving substance to science - empiricism to metaphysics). i) Simplicity / Occam's razor: We apply this to science itself to deduce the most simple science theory of reality. This prevents us from describing reality in terms of many discrete and separate things (matter 'particles'). ii) Empirical: We all experience existing in one common space. iii) Logical: Waves / interconnected wave patterns behave logically. i) Substance: Only one substance exists, this space we all commonly experience existing in. ii) Causation and Necessary Connection: By describing reality in terms of only one substance, space, we can easily understand how matter's spherical in and out waves are necessarily interconnected with other matter in the space around it. This is why you can see distant stars - your body is a wave structure of the universe vibrating with all this other matter. And hopefully it is now more clear to you this profundity of metaphysics - being central to: simplicity, unity, reality, necessary connection, causation, logic, knowledge, certainty, senses, science and truth. Once we have the correct solution it is easy to see where we made the error. We just have to go back to the time of Huygens (1629-1695), Newton (1642-1727) and Leibniz (1646-1716). History shows that we took the path of Newton and tried to describe an inter-connected reality with many discrete and separate matter 'particles'. This then required mathematical relationships to connect the matter particles in space and time - where particles have 'mass' and are connected by 'forces' as per Newton's famous law of inertia F=m. a. The correct path. Well we just had to combine the ideas of Huygens (waves), Leibniz's monadology (matter and universe are one interconnected thing) and Newton's Mechanics (space). From this we can deduce the correct substance (space) and its properties (a wave medium) as a partial solution to metaphysics (space may have more properties - I do not know). Thus we simplify Newton's metaphysics from the motion of matter particles in space and time, to the wave motion of space that causes matter and time. i.e. From a metaphysics of Space and Time to a Metaphysics of Space and (wave) Motion. In this way we unite not only space and time but also matter and energy - as one connected thing, the wave motion of space that causes matter and time. Matter is a large structure of the universe (not a tiny 'particle'). A spherical wave structure where the wave center 'particle' is in continual two way communication with all other matter in the observable universe due to its spherical in and out waves. Thus we can now understand very simply and sensibly how one substance space (and its wave motions) is the ultimate foundation for causal connection of both physical reality and mathematical physics. In ending, let us return to the start and consider why a ball falls to the earth. Well the wave equations tell us that the waves travel more slowly in higher energy density space (where there is more matter). Thus the spherical in waves that travel through the earth have a slower velocity than the waves coming in from the space above. This causes the wave center to re-position towards the center of the earth. We call this gravity - but now we can understand the true causal connection in physical reality (space) that causes this gravitational attraction. Note: This is a very approximate diagram, just to show the idea of how the spherical in waves determine the future postion of the wave center (the motion of the particle). We have a page of wave diagrams that will help you visualise the spherical standing wave structure of matter (WSM) in space. Basically, we only see the high wave amplitude wave-center and have been deluded into thinking matter was made of tiny little 'particles'. A very naive conception in hindsight - and quantum physics was telling us all along that waves were central to light and matter interactions! 1. We must imagine how things are connected together - and this has led to a lot of fanciful nonsense being written because 'metaphysics is beyond our senses'. Solution: The spherical in out waves explain this hidden causal connection of matter that is the cause of our senses. i.e. We only see the high wave amplitude wave center, not the spherical in and out waves, and this deceived us into thinking matter was a tiny 'particle'. Thus we were blind to how these discrete 'particles' were interconnected in space and had to invent 'forces / fields'. 2. Newton / mathematical physics replaced a metaphysics of substance with a metaphysics of mathematics, then discovered that our mathematical theories did not quite work (we could not unite quantum physics with Einstein's relativity) and that mathematics itself was without foundation. Solution: Again the logical behavior of interconnected repeating wave patterns explain the source of this mathematical logic, why this is so useful in mathematical physics, while also simply uniting these two famous physics theories. 3. These past failures of metaphysics have resulted in our postmodern world where academics are convinced we cannot correctly imagine reality. Thus all truth is cultural - socially informed constructs which are relative, evolving approximations of reality. This has led to the extremely silly and dangerous view that all truths are equal - just personal opinions really. Solution: We all experience existing in one common space. This is a universal absolute truth. We can deduce how a spherical wave structure of matter must behave in this space and then show that this exactly matches how an electron behaves. This then explains and solves the central problems of physics. There is no opinion - this will be true for all people. Conclusion: Once we have the correct metaphysical foundations for describing reality it is remarkably easy to solve the central problems of metaphysics and thus also physics and philosophy by understanding how matter exists and moves about in Space in a necessarily interconnected way. Please see articles on the side of this page. Any comments / questions please post them below on Facebook Connect. Thanks. There must then be a principle of such a kind that its substance is activity. ... it is impossible that the primary existent, being eternal, should be destroyed. ... that among entities there must be some cause which moves and combines things. It is a good thing to proceed in order and to establish propositions (principles). This is the way to gain ground and to progress with certainty. ... I hold that the mark of a genuine idea is that its possibility can be proved, either a priori by conceiving its cause or reason, or a posteriori when experience teaches us that it is a fact in nature. Note: This is a summary from the main Principles in Physics page (which is very good). In the evolution of philosophical thought through the centuries the following question has played a major role: what knowledge is pure thought able to supply independently of sense perception? Is there any such knowledge? If not, what precisely is the relation between our knowledge and the raw material furnished by sense impressions? There has been an increasing skepticism concerning every attempt by means of pure thought to learn something about the 'objective world', about the world of 'things' in contrast to the world of 'concepts and ideas'. During philosophy's childhood it was rather generally believed that it is possible to find everything which can be known by means of mere reflection. It was an illusion which anyone can easily understand if, for a moment, he dismisses what he has learned from later philosophy and from natural science; he will not be surprised to find that Plato ascribed a higher reality to 'ideas' than to empirically experienceable things. Even in Spinoza and as late as in Hegel this prejudice was the vitalising force which seems still to have played the major role. The more aristocratic illusion concerning the unlimited penetrative power of thought has as its counterpart the more plebeian illusion of naive realism, according to which things 'are' as they are perceived by us through our senses. This illusion dominates the daily life of men and of animals; it is also the point of departure in all of the sciences, especially of the natural sciences. Gradually the conviction gained recognition that all knowledge about things is exclusively a working-over of the raw material furnished by the senses. Galileo and Hume first upheld this principle with full clarity and decisiveness. Hume saw that concepts which we must regard as essential, such as, for example, causal connection, cannot be gained from material given to us by the senses. This insight led him to a skeptical attitude as concerns knowledge of any kind. Man has an intense desire for assured knowledge. That is why Hume's clear message seemed crushing: the sensory raw material, the only source of our knowledge,through habit may lead us to belief and expectation but not to the knowledge and still less to the understanding of lawful relations. Then Kant took the stage with an idea which, though certainly untenable in the form in which he put it, signified a step towards the solution of Hume's dilemma: whatever in knowledge is of empirical origin is never certain. If, therefore, we have definitely assured knowledge,it must be grounded in reason itself. This is held to be the case, for example, in the propositions of geometry and the principles of causality. These and certain other types of knowledge are, so to speak, a part of the implements of thinking and therefore do not previously have to be gained from sense data (i.e. they are a priori knowledge). Today everyone knows, of course, that the mentioned concepts contain nothing of the certainty, of the inherent necessity, which Kant had attributed to them. The following, however, appears to me to be correct in Kant's statement of the problem: in thinking we use with a certain "right", concepts to which there is no access from the materials of sensory experience, if the situation is viewed from the logical point of view. As a matter of fact, I am convinced that even much more is to be asserted: the concepts which arise in our thought and in our linguistic expressions are all- when viewed logically- the free creations of thought which cannot inductively be gained from sense experiences. This is not so easily noticed only because we have the habit of combining certain concepts and conceptual relations (propositions) so definitely with certain sense experiences that we do not become conscious of the gulf- logically unbridgeable- which separates the world of sensory experiences from the world of concepts and propositions. Thus, for example, the series of integers is obviously an invention of the human mind, a self-created tool which simplifies the ordering of certain sensory experiences. But there is no way in which this concept could be made to grow, as it were, directly out of sense experiences. 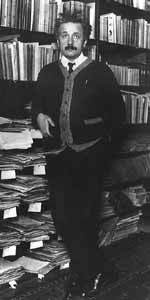 As soon as one is at home in Hume's critique one is easily led to believe that all those concepts and propositions which cannot be deduced from the sensory raw material are, on account of their 'metaphysical' character, to be removed from thinking. For all thought acquires material content only through its relationship with that sensory material. This latter proposition I take to be entirely true; but I hold the prescription for thinking which is grounded on this proposition to be false. For this claim- if only carried through consistently- absolutely excludes thinking of any kind as 'metaphysical'. In order that thinking might not degenerate into 'metaphysics', or into empty talk, it is only necessary that enough propositions of the conceptual system be firmly enough connected with sensory experiences and that the conceptual system, in view of its task of ordering and surveying sense experience, should show as much unity and parsimony as possible. Beyond that, however, the 'system' is (as regards logic) a free play with symbols according to (logically) arbitrarily given rules of the game. All this applies as much (and in the same manner) to the thinking in daily life as to the more consciously and systematically constructed thinking in the sciences. By his clear critique Hume did not only advance philosophy in a decisive way but also - though through no fault of his - created a danger for philosophy in that, following his critique, a fateful 'fear of metaphysics' arose which has come to be a malady of contemporary empiricist philosophising; this malady is the counterpart to that earlier philosophising in the clouds, which thought it could neglect and dispense with what was given by the senses. ... It finally turns out that one can, after all, not get along without metaphysics.